In 1969 Senator Gaylord Nelson of Wisconsin conceived the idea of a national teach-in to increase public awareness of the rampant environmental problems of the times. On April 22, 1970, the first Earth Day was celebrated. In celebration of both this large Gaylord Nelson project and Nelson's Earth Day legacy, this gallery comprises a selection of 130 Nelson images from 1954-2006. The photographs in this gallery document Nelson's early life in Clear Lake, Wisconsin as well as his career as Governor of Wisconsin, U.S. Senator, founder of Earth Day, and his work as an environmentalist. Several images show Nelson with prominent people, many of whom were his close personal friends. The collection spans the years 1954-2006, covering Nelson's senatorial career and his post-senatorial activities, and documents his greatest legislative achievements, including the establishment of the Apostle Islands National Lakeshore; the preservation of the Appalachian Trail; the incorporation of the St. Croix, Namekagon, and Wolf rivers into the National Wild and Scenic Rivers System; and the organization of the first national Earth Day Teach-In. Nelson also contributed to the development of the Environmental Education Act; and aided in the passage of the Menominee Restoration Act and the establishment of the Upper Great Lakes Regional Commission. 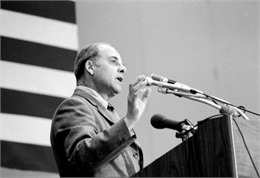 Nelson may be less well known as one of only three senators opposed to the war in Vietnam; for his strong advocacy of civil rights; for his efforts to combat poverty; for his fight against the tire and automobile industry to adopt new safety standards; and for opening up the discourse on the problems and abuses of the pharmaceutical industry. It was said by his colleagues that Nelson was the conscience of the Senate and he was well known for his bipartisan leadership. 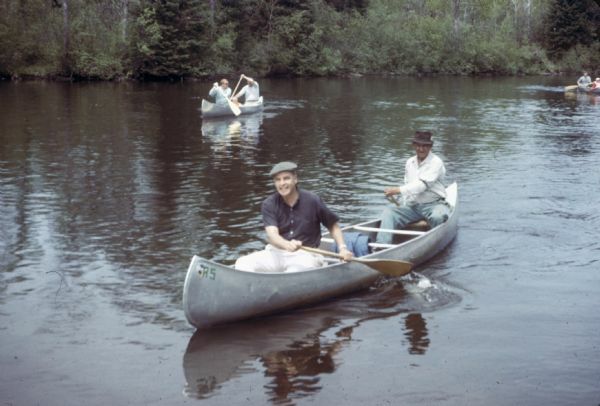 Gaylord Nelson Canoeing The Namekagon River, 1966 ca. Nelson donated a portion of his senatorial papers to the Society in 1974; the rest of the materials arrived in 1980 upon Nelson's defeat in the Senate. These two accessions constituted the bulk of the Nelson collection, totaling 1,040 boxes of paper, audio recordings, films, photographs, scrapbooks and video recordings. The papers remained unprocessed, however, until 2006 when the Society received a generous grant from the Evjue Foundation. In addition to the grant, the Nelson Institute of Environmental Studies at the University of Wisconsin-Madison has been a major financial contributor to the project. Since then, the work to identify, organize and describe the materials in the collection has been ongoing. And now the most significant portion of the collection has been preserved, organized and described in a finding aid available online through the Society's website. The Society also holds Nelson's official papers as governor of Wisconsin (1959-1963). 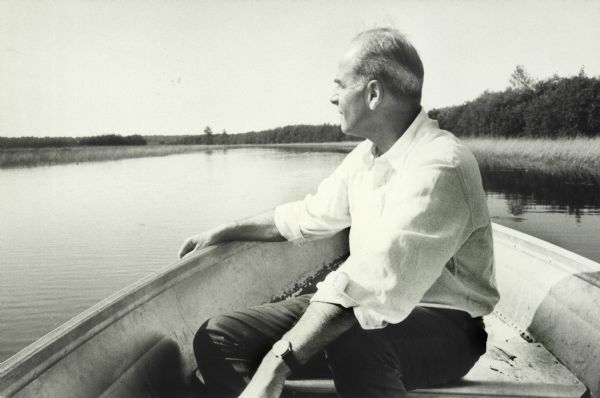 Note: To read more about Gaylord Nelson and the environmental movement in Wisconsin, see Nelson's Earth Day Legacy website. The Gaylord Nelson papers and other records are available to the public at the Wisconsin Historical Society during regular archives hours. View the catalog listing for the Gaylord Nelson Papers, 1954-2006. View Nelson's biography on the Wisconsin Historical Society website.